The receptionist was very welcoming and even gave us some good information were to eat. The room is very clean with comfy beds. It was clean and near all the points of interest. Good value for money. I only liked that it was clean and they had a comfortable mattress. Good location and value for money, Quiet and clean, despite being on busy shopping street, Front desk staff was very helpful. Good breakfast with long hours. Very conscientious young man working in the breakfast room who was pleasant and helpful and replenished everything efficiently. The only thing that i liked was that the location is very good positioned. The staff was very friendly and nice,the room was rather small but clean. Aegeon This rating is a reflection of how the property compares to the industry standard when it comes to price, facilities and services available. It's based on a self-evaluation by the property. Use this rating to help choose your stay! Enjoying a central location in Thessaloniki, close to Aristotle’s Square, Aegeon Hotel offers fully equipped accommodations, close to the city’s main attractions. Aegeon provides a variety of tastefully decorated rooms to accommodate solo travelers as well as couples and groups. Each one is equipped with modern bathroom facilities and a refrigerator for chilling drinks. The excellent central location makes Aegeon Hotel an ideal choice for travelers wishing to explore the city’s archeological sites on foot. There are plenty of bars and restaurants nearby. It is also a great base for business travelers who need to be close to the trade market. 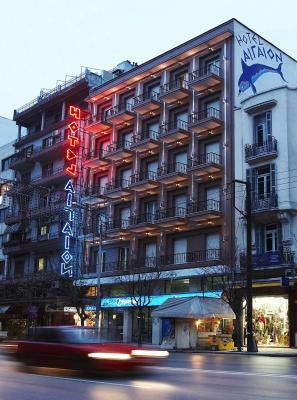 Thessaloniki’s train station and port are conveniently within 1,650 feet of Aegeon Hotel. Those guests wishing to explore the area further can rent a car from Aegeon and the staff team is happy to help with any tourist information. When would you like to stay at Aegeon? Features simple decor and warm colors. A bright, spacious room, with simple decor and warm colors. Features a private balcony with views of the most central avenue of the city. A bright, spacious room, with simple decor and warm colors. House Rules Aegeon takes special requests – add in the next step! Aegeon accepts these cards and reserves the right to temporarily hold an amount prior to arrival. Guests with an American Express credit card should note that they have to inform the hotel directly of the date of the card's issue, as well as the expiry date. -if the reservation is modified or canceled later or in case of no-show, 50% of the total value will be charged. Its location is great. 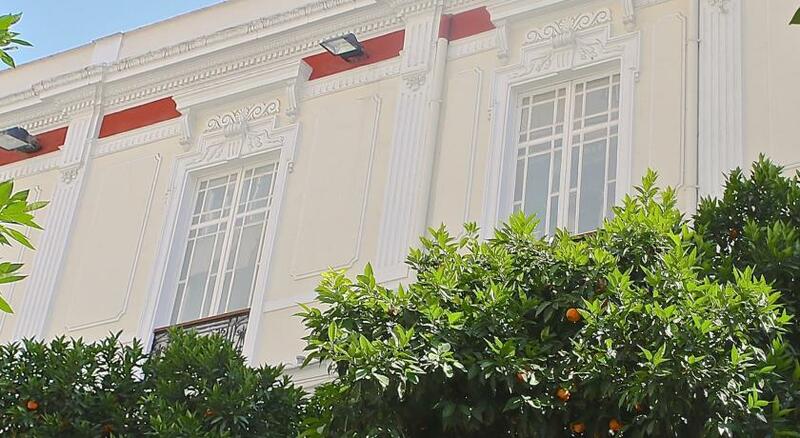 It is about a 15-minute walk from Aristotelous Square and the bus stop to and from the airport is just at the hotel. The room was very clean and comfortable. The space might not be very large, but it is what is needed. We asked for a quiet room beforehand and we were indeed provided with one of the quietest rooms of the hotel. The location is great and there is a private parking (paid) right behind the hotel, so access by car was very easy in a generally busy area. Finally we had to cancel our initially planned trip and booked days, but from the hotel they were kind enough to change our dates to another suitable time for us easily and without any extra cost. My room was at the fourth floor and I couldn't connect to the wifi. I tried my 3 devices and non of them couldn't connect to the wifi. However, I didn't have the same problem at the reception desk where I checked the wifi with receptionist. The room's floor wasn't cleaned enough. The mattress is very old and there are some gaps that make your sleep uncomfortable. The last but not very important is the CRT TV. I think the hotel needs a renovation. I liked the staff, they was very friendly and they were ready to help you for everything. Also, the location it is very good. The hotel is 10 minutes on foot to the center and there is a bus stop suitable if you want to move to the airport or if you want to reach the hotel from the central shuttle bus station. Finally, the room was warm and there was all day hot water for shower. The horrible room was given was looking behind, it was like a cave. the size of the lift...oh..my buggy was HUGE! impossible to put it inside. i liked the location, the staff at reception, the ladies who were cleaning my room! Everyone was ever so helpful to me (i travelled alone with a 2 year old!). All members of staff were exceptional and there for me on anything i asked their help with! Thanks! The hotel is located right on a very busy street. But I guess most of the city centre is like this. I only stayed here for one night before my flight back, so the fact that the hotel is located right next to the bus stop for the airport express bus was great. The room, while not so big, is just everything you need. The breakfast was very nice! Excellent breakfasts (Greek coffee included! ), noise isolation, really caring of all yr needs and smiling stuff). Good locations, all amenities are near the hotel. Rooms windowed inner yard are quite.